Qantas still lets you bring one suitcase and one board bag for free. So the night before I get on the plane I look at Google maps to find out the names of the cities I've got to drive through from the airport to my destination. Then I put those cities into Craigslist and those zip codes into eBay and sort by auctions ending within 24 hours before my arrival. If I'm lucky, a little gem like this will pop up. 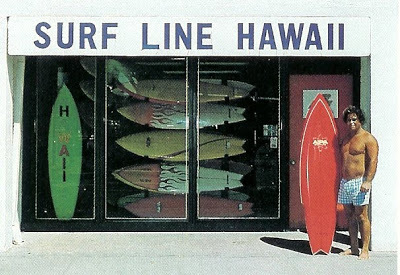 A 6'1" early 70's Wave Crest Hawaii stinger. I arranged to meet the guy at Starbucks and BOOM I've got myself a rider for my week in Cali. 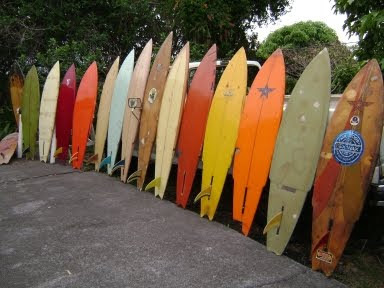 The board looked strangely familiar to me, and not because I'd just found or sold 3 other Wave Crest Hawaii stingers in the past couple of months. 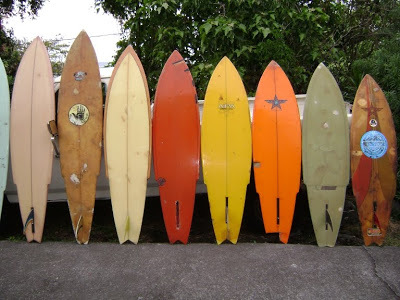 Then my new friend who owned the board reminded me that Tim Orr from Kona had shared pics of it on this blog a few years before prior to its restoration. Small world- from Hawaii, to Cali, to OZ. I'd never ridden a stinger before and I could never really get my head around the concept. The design looked like it would be really stiff, but I knew this couldn't be the case cause I'd seen Buttons Kaluhiokalani (RIP) doing 360's on them in Many Classic Moments. The board paddles great, lots of volume up under the chest. It catches waves easy too, as you'd expect. But as you get to your feet and get to the bottom, everything changes. You go from riding the flat area at the front of the board then suddenly the tail bites and its all about the swallow tail. Because of the narrow tail, it goes rail to rail really easily, its actually quite loose. The trouble comes, if your not used to it like me, if you go for a little head dip. I tried to pull in on few and i'd put my weight up on my front foot. 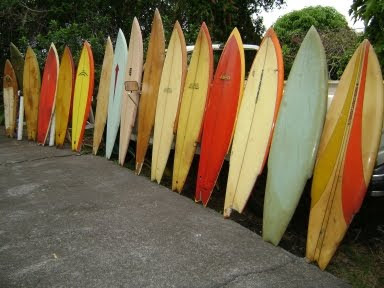 The big fat soft rails up the front would not want to hold in like the tail and the board side slipped down the wave. Latter I just stayed on the tail and successfully managed to get a couple of pits! 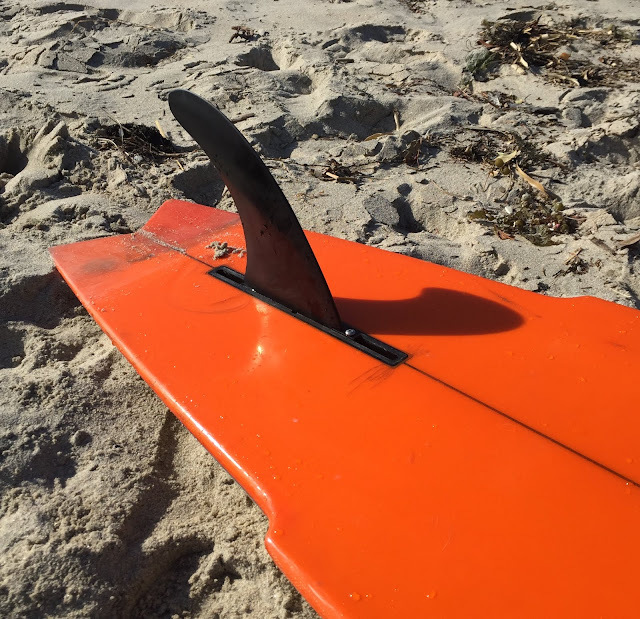 Surfing Trestles is the quintessential Californian surfing experience and nothing turns me on like skipping across those tracks and seeing cool, clean lines out there. 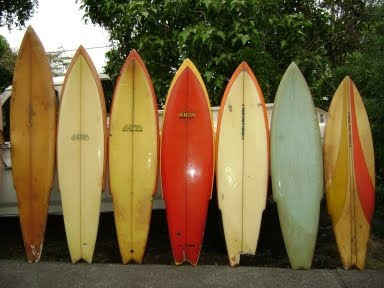 The stinger deign was developed by Ben Apia and surfed to prominence by the likes of Mark Richard's, who later brought the designs back to OZ. I got a great week of waves on the little stinger, finishing off with a session at Salt Creek with these characters!